A buttery crispy spicy dosa is a great treat to all those dosa fans. Dosa is a comfort food for most of us and i often prepare dosa for a healthy breakfast menu. Hope you all enjoyed the Masala dosa recipe that i had posted last week. 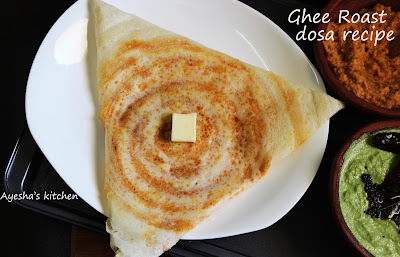 Today am gonna share a crispy crunchy lovely spicy ghee roast dosa / ney roast. We all love to have crispy ghee roast for snacks or for breakfast along with sambhar and chutney. Am i right? Yes we do love that buttery flavored crispy dosa. 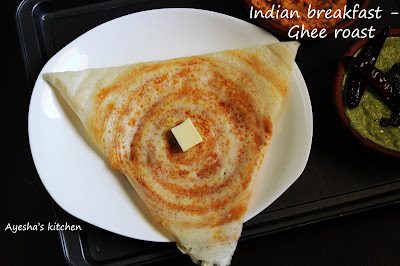 Batter recipe is same like Masala dosa batter only but while making dosa you must spread it well for thin and crisp ghee roast / nei roast. This dosha is my daughter's favorite choice in restaurant and she calls it as 'masala dosa without masala'. You can make this dosa batter easily at home and can make varieties of dosa with the same batter. Like spring dosa, ghee roast dosa, paper dosa, masala dosa, egg dosa and uttappam too . Do try this yummy easy breakfast recipes at home. Always cook good breakfast dishes for your family. Wash and soak idli rice / parboiled rice, urad dal, fenugreek seeds, bengal gram in enough water for 5 hours. Grind them until smooth texture after 5 hours by adding little by little water if required(do not add more water at a time). No need of water for wet grinder. Transfer it to a bowl , add salt and mix well. Some add salt only while making dosa. But i used to add dosa immediately after grinding. Leave it over night for fermentation. (required minimum 8 hours in summer and it differs according the climate). Once the flame is medium low, pour a ladle full of dosa batter and then quickly spread it evenly in a circular motion for center to outside with the back of that ladle. Make the dosa very thin for more crispiness. Immediately drizzle some oil / ghee / butter in a circular motion. Spreading a tsp of chili coconut chutney(recipe below) will makes dosa more delicious though it is optional. And now increase the flame little bit and then cover it with a lid. Cook for a minute and once the edges become golden open the lid. Now you can fold it as per your wish. Either fold from both sides or can make triangle shape or can make cone dosa. Roast an onion roughly chopped, four dried red chilies and two garlic pods in 1 tbsp of oil for a minute over medium flame and then coarse grind them once cooled. To this add half a cup of grated coconut and again pulse grind it with a pinch of salt. Chili coconut condiment or chutney ready.